The annual pilgrimage of Brethren from Seaview Lodge and this year accompanied by Brethren from Hale with Justice Lodge left Perth in the Grand Lodge Bus at 6.00am on Thursday 6 September. Members on the bus were: VW Bro Lauder Coomber, W Bros Mick Waterson, Shane Sadler, Dennis Lamb (WM) and Bro Jamie Holloway (from Seaview) and MW Bro Steve Jancec and W Bro Frank Audus (from Hale with Justice). Noticeable absentees were RW Bro Ian Mansfield and VW Bro Lloyd Little who were unable to make the trip due to health issues – nothing serious! First stop was Dalwallinu where the group visited the memorial to Freemasonry in the main street of town – a very tastefully designed tribute to Dalwallinu Freemasonry with the Lodge now being in recess. Would recommend to any Masons driving through Dalwallinu that you stop and have a read of this very well done contribution to the history of Freemasonry in that District. 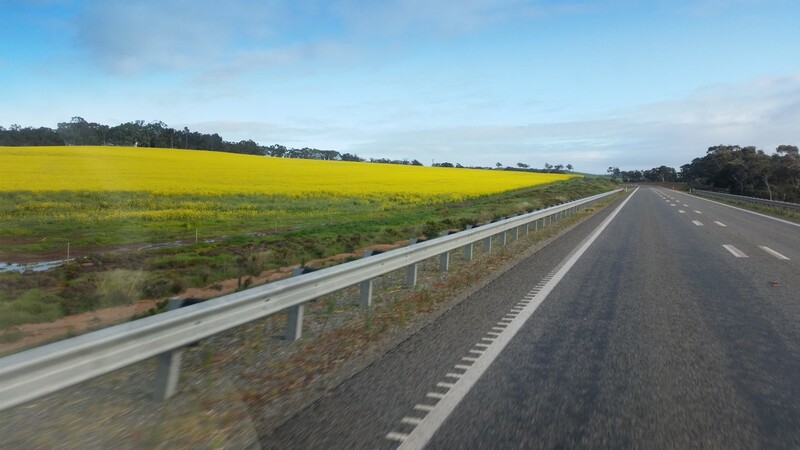 Onwards through the wildflower area from Paynes Find to Mount Magnet and a quite disappointing array of flowers – apparently great further west but not so great where we were. Fair to comment that some members of the party were a great deal more circumspect in terms of keeping their bodies hydrated this year than last year – seems that you can teach some old dogs new tricks!! Up early on Friday and , disappointingly, the mobile food van which was such a hit last year in Meekatharra, was not operating this time. Arrived in Newman about 1.00pm after the compulsory stop in Cue to visit the old Masonic Hall – built in 1899. VW Bro Les Troman (Corinthian Family Lodge) was picked up the airport and joined us at the SES Dongas. Friday evening saw the Brethren assisting Capricorn members with a Third Degree – W Bro Dennis Lamb in the Chair. Typically beautiful curries provided by Capricorn members were one of the highlights of the Festive Board. 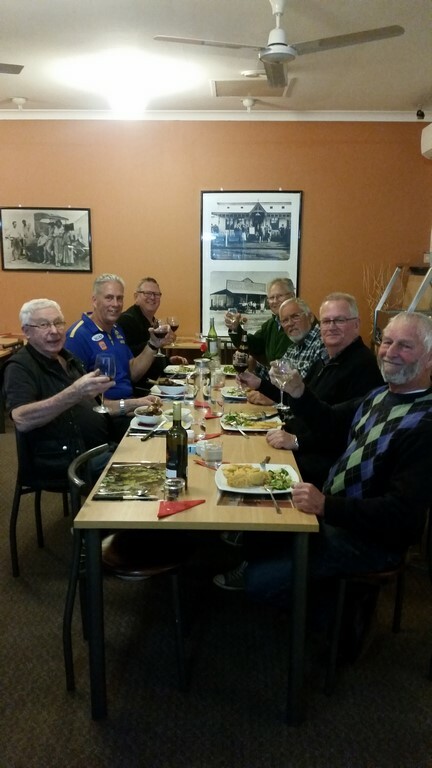 Bro Jamie Holloway spent the evening singing the Melbourne Football Club team song – not sure why! On the Saturday morning RW Bro Peter Kirwan conducted a Deacons training course which quite a few members attended including a very keen EA from Capricorn – this young man spent most of Friday night with the Tyler (VW Bro Coomber) and again on Saturday for the Installation, also attended the Deacons session and was first up on Sunday morning to assist with the cooking of the recovery breakfast. Sadly, for Capricorn, he is leaving Newman in 6 weeks or so and , hopefully, Seaview will become his new Masonic home. The reports on the Installation were glowing with WIO W Bro Adam Majid and the new WM W Bro David Evrett both performing their roles with distinction. At the Festive Board and, after the usual toasts, RW Bro Mike Claydon was presented with the Mulla Mulla Award for his services to Freemasonry in the Pilbara. On to the Seasons Restaurant for the usual lovely meal and Capricorn’s traditional large raffle which raised in the order of $2,700 which included an auction for a beautiful pearl from Willy Creek Pearls. 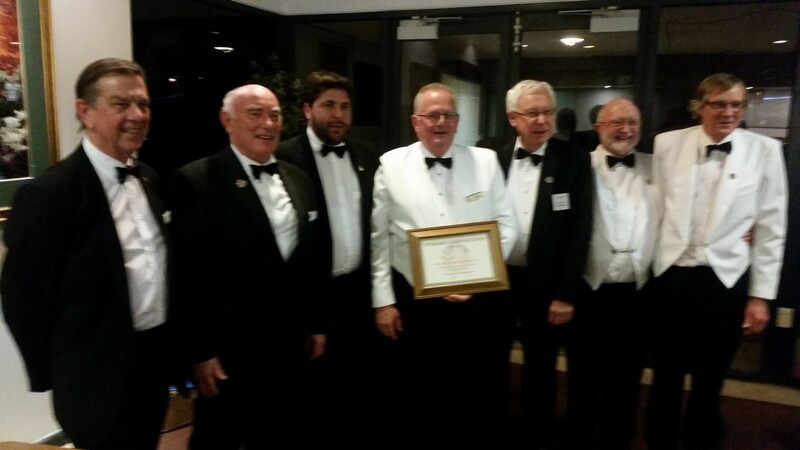 During the evening W Bro Mick Waterson was presented with a Pilbara Ambassador award in recognition of his support of Capricorn Lodge through his regular pilgrimages to Newman. Fair to say that W Bro Waterson was very emotional when receiving the Award – as indeed have been all the previous winners. Seaview now has three recipients of this award – RW Bro Ian Mansfield, VW Bro Lauder Coomber and now W Bro Mick Waterson. Up and at it early on Sunday morning for the recovery breakfast and the bus hit the road for Perth at 7.15am and arrived safely home at about 8.00pm. 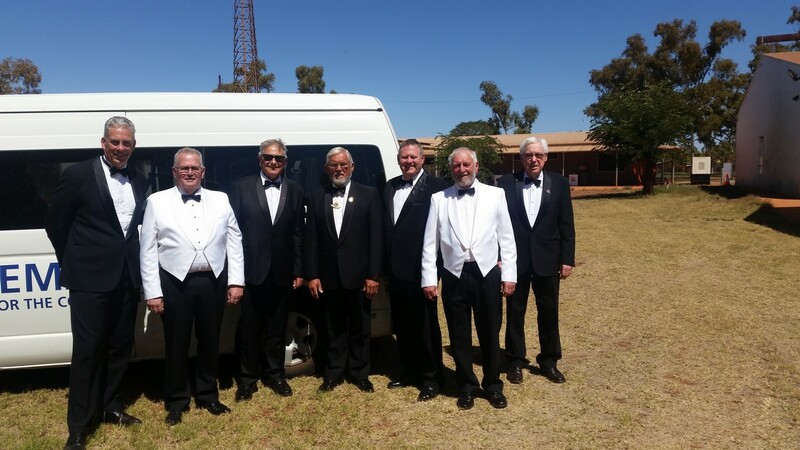 Another wonderful experience in the Pilbara – great fellowship and the establishment of new Masonic friendships. Role on next year.